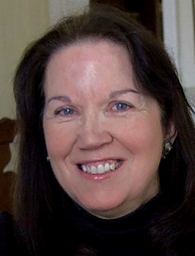 Joan Murray writes poetry, fiction, and personal essays. Her work has appeared in the Atlantic, Harper’s, the Hudson Review, the Nation, the New York Times, the Paris Review, Ploughshares, and the Sun. Her five collections of poetry include Looking for the Parade (Norton, 1999), which Robert Bly chose as a winner of the National Poetry Series Open Competition; Queen of the Mist: The Forgotten Heroine of Niagara (Beacon, 2000), which she received a Broadway commission; and Swimming for the Ark: New & Selected Poems 1990-2015, the inaugural title in White Pine Press’s Distinguished Poets Series. A two-time National Endowment for the Arts Poetry Fellowship recipient, she is editor of The Pushcart Book of Poetry: The Best Poems from Thirty Years of the Pushcart Prize (Pushcart Press, 2009). Her website is JoanMurray.com . St. Christopher’s Inn: I’ve come too early, so I sit in my car and watch a mother enter with her son. She walks ahead, holding the outdated suitcase. Both are nervous. I am too. The mother will leave soon. I’ll leave by mid-afternoon. The young man will stay three months for rehab. The court has sent him here. I’ve come to give readings and workshops with funds from Poets & Writers. When he and I leave, we’ll both be changed. Wiawaka: It’s a long drive up the Northway, then a crawl through touristy Lake George and onto a pine-shaded road that winds to a rustic sign. I’ve Googled the place and know it was founded in 1903 by a tycoon’s rebellious daughter, who wanted to offer factory girls a lakeside holiday. Poets & Writers is funding me to spend a weekend here and give a workshop and two readings to strangers; all will be women. Cambridge Mansion: I pull up to a sprawling turn-of-the-century estate with Doric columns, lattice porches, French doors, and an elongated wheelchair ramp. It was the home of the marketing genius who gave the world Doan’s pills. I am here, thanks to Poets & Writers, to read to the residents. I’ll leave in an hour; most of them never will. St. Christopher’s Inn: A hundred men sit before me on folding chairs. An equal number will come later. Most are young, from metro New York City, full of energy. We’ll be together for an hour and a half. I’ll read to them. (They’ll like my poem about walking through a subway tunnel.) I’ll give them a lesson on how to access their lives and emotions and turn them into poems. Then I’ll ask them to write. But will they? Wiawaka: Over the weekend I’ll give a workshop and two readings. My workshop topic is quicksand poems. My lesson will have lots of techniques and sample poems for stimulation—then quiet, quiet, quiet—all of us writing. After, they’ll read their brand-new poems, and I’ll point out strengths and problems. My first reading will be that night in the parlor. The second, Sunday morning on the dock, is to inspire them before they go. Cambridge Mansion: It takes a long time for them all to get to the parlor. Some are in wheelchairs; some have walkers; others, dementia. Why have I come? I can picture myself here: mind alert, full of all I know, but a bit creaky, my body, too. I will read to them from my book about the sixty-three-year-old teacher who went over Niagara Falls in a barrel, then struggled on until she died at eighty-three. They’ll all relate to that. St. Christopher’s Inn: The man who stuttered. The men who wept. The man with an MFA. Two illiterate men who dictated poems to others. The men who read about their sons and daughters. The disabled man who read about watching others run. The men who wrote about shooting up, getting caught, overdosing, struggling to recover. The ones who put their arms around each other; the rest who left proud because of poems. Wiawaka: The lesbian who wrote lovingly to her body. The eighty-five-year-old who longed for her late husband’s touch. Three middle-aged women telling of childhood abuse for the first time through poetry. The woman whose veteran husband has PTSD, the trauma nurse whose newborn had a stroke. The fact that we all have secrets, to tell or not. Cambridge Mansion: The man who visited Niagara as a boy, the one who went on his honeymoon. The woman who said, “My name’s Joan too. I remember you.” My gratitude to Poets & Writers. Learn more about the Readings & Workshops program, which supports Murray and hundreds of other writers who give readings and lead writing workshops, at pw.org/funding .